This article has been prepared by Carolyn Birch, Chair of Redlynch and District Local History Society. This well known family were long established farmers in the Downton area and several members were engaged in The Great War. William Taunton was living in Redlynch in 1841 at the age of 20 when he was unmarried. He farmed ‘Redlinch’ Farm, leased from the Nelson estate, we believe from the late 1840s. He is shown at the farm in the 1851 Census where he states that he is farming ‘1,050 acres with 80 labours.’ He married Anne Goodeve Whitchurch in 1848, and in 1850 they had a child William W. Taunton who became a general medical practitioner, which took him to many other areas. He died in 1915. William and Anne had two daughters, Edith Henrietta who married Arthur Elliott Viney and Emily. They also had another son, Henry Percy in 1864 who took over the running of this large farm in 1898 when William died. The Reading Room off Petticoat Lane was built in William’s memory. Percy, as he appears to have been known, married Katherine Livingstone Manning in 1889 in Kensington. They had two sons, Ivon Hope and Oscar and two daughters, Phyllis and Katherine. He was well versed in handling working horses and we know of two entries in the Bristol Times and Mirror when he won prizes for his cart mare horses in the Dorchester and Frome shows of 1897. Shortly after the outbreak of war he must have offered his services to the Army voluntarily and became initially a Captain (and then later a Major) as the director of No. 3 Base Remount Depot (which dealt with the training, welfare and supply of horses in the War) in France, we believe in or near Dieppe. Records show that he was certainly there on 19th April 1915 and we know that he did not return to Redlynch until 1920. Kelly’s Directory shows that Donald Egremont (snr.) was the farmer at Templeman’s Farm in 1915 but we also know from his son’s writing that he took over the farm at Michaelmas 1912. Percy Taunton was at Templeman’s Farm at the 1911 Census and was also at Parsonage Farm, Downton according to the 1911 Kelly’s. Percy gained the British, Victory and Star medals. After the War, Percy acted as a Councillor for Wiltshire County Council and as a Magistrate. He died in 1947. Incidentally, William Eyre-Matcham, born in 1865, who had retired from the Army in 1905 served during the Great War as Deputy Director of Remounts. Ivon was the elder of son of Percy and Katherine, born in 1891 and in the 1911 census he is recorded as being a theological student. He served as a Captain in the Indian Army Reserve of Officers and we conclude that he may have been in India at the outbreak of war. He gained the British and Victory medals. After the War, it seems that he made his career in India and on the 9th March 1946 he received a Knighthood in recognition as advisor to His Excellency the Governor of Bombay (London Gazette 5th April 1946). We know that he remained unmarried, lived for a period in Hunters Close, Downton and died in Breach Candy Hospital, Bombay on the 3rd December 1957. His probate record states that he left only £148-8s-5d. Oscar was born in 1894. The 1911 census records that he was boarding in South Manchester where he was attending an engineering college as a student. Whilst there, he joined the East Lancashire Territorial Force. He volunteered at the outbreak of war and was made up to Lieutenant in the 1st (East Lancashire) Field Company Royal Engineers, which was attached to the East Lancashire Regiment. 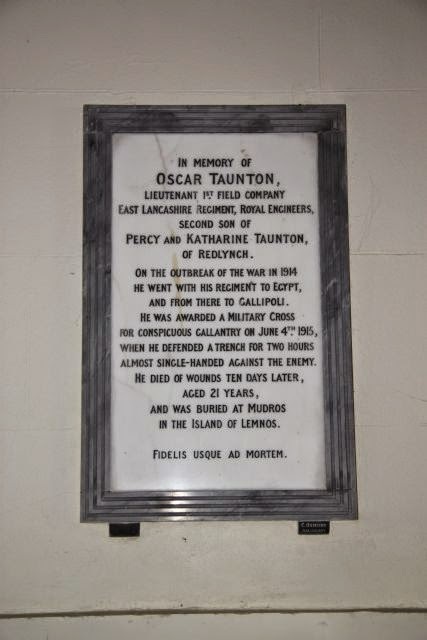 The tablet in memory of Oscar Taunton in the Baptist Church, Downton. second son of Percy and Katharine Taunton of Redlynch. On the outbreak of the war in 1914 he went with his regiment to Egypt, and from there to Gallipoli. He was awarded a Military Cross for conspicuous gallantry on June 4th 1915, when he defended a trench for two hours almost single-handed against the enemy. Taunton Viney was the nephew of Percy Taunton, being the son of his sister Edith and his brother-in law Arthur. He was born on the 14th November 1891 in Saffron Walden, Essex. He gained his flying certificate in a Caudron Biplane at the Royal Air Station in Eastbourne on the 1st July 1915. Taunton served as a Flight Lieutenant in the Royal Naval Air Service (5 Wing). He was engaged off the Belgian coast on the 28th November 1915 about 6 miles west of Middelkerke in dropping bombs from a Henri Farman HF27 on to a German U-boat which caused its destruction and sank on the spot. There seemed to be a dispute as to whether a U-boat was actually sunk but he was awarded the DSO in connection with this action. On May 21st 1916 he was bombing Mariakerque Aerodrome in a Sopwith 11/2 Strutter, when he had cause to crash into the sea and his body was recovered by the German military. Taunton was given a dignified funeral service by the Germans with full military honours and photographs of the funeral and of his grave were dropped behind the English lines. 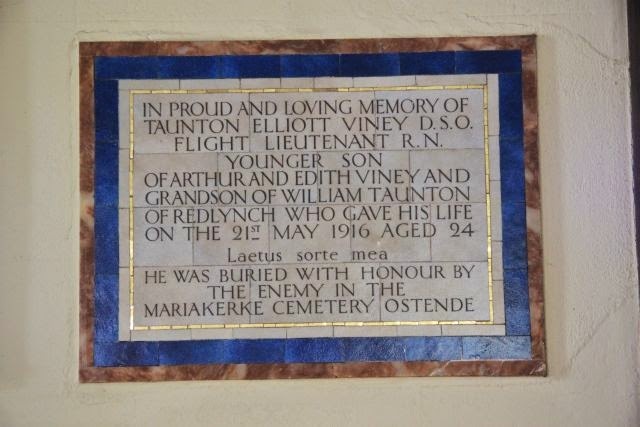 “In proud and loving memory of Taunton Elliott Viney D.S.O. Flight Lieutenant R.N. younger son of Arthur and Edith Viney and Grandson of William Taunton of Redlynch who gave his life on the 21st May 1916 Aged 24.